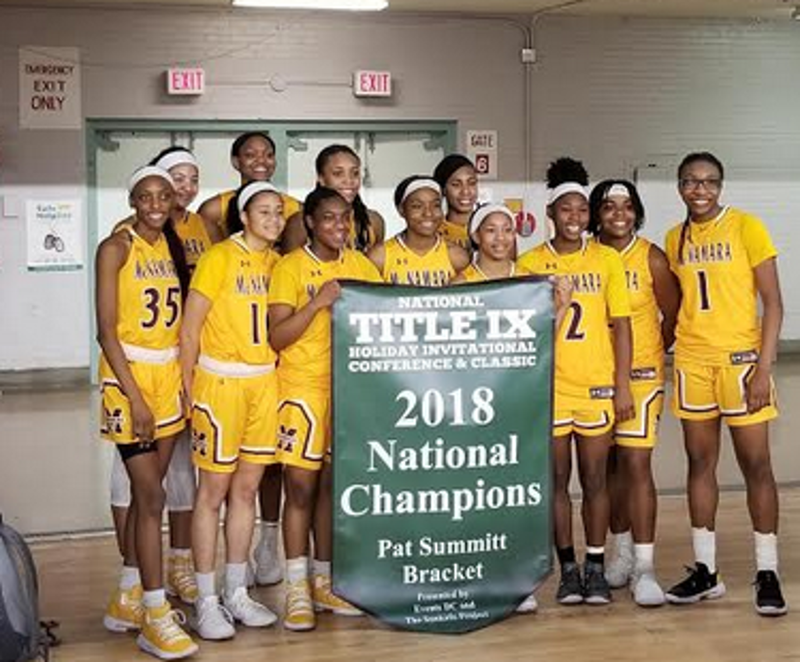 Celebrating its 10th year, the 2018 Title IX DC Classic saw Bishop McNamara of Forestville, Maryland, continue to tighten its grip on its claim to being America’s top high school basketball team. The event was held December 27-29 at the DC Armory in Washington, DC. Each day, five courts of non-stop action saw 74 teams (including eight junior colleges) play in brackets of eight teams. This number included a few individual showcase games where teams played just a single game. Presented by The Sankofa Project and sponsored by Events DC, 147 college coaches (most from NCAA Division 1 schools from the eastern half of the USA) representing 84 colleges (some schools sending two) attended one or more days of the event. Although the top divisions (Pat Summitt, Bob Headen and Patsy Mink), had the great majority of high mid-major and Power 5 talent, there were prospects for lesser D1, D2, D3 and NAIA in lower divisions. You just had to search for them. There was also junior college division (Allen Chin) of eight teams to potentially draw players from. Coming into the final, both teams were undefeated and ranked (B Mc #1 and RP #14) nationally by MaxPreps. Bishop McNamara had several advantages including depth (at least nine future Division 1 players), more Power 5 talent (at least three for Bishop McNamara to one for Roland Park) and height. 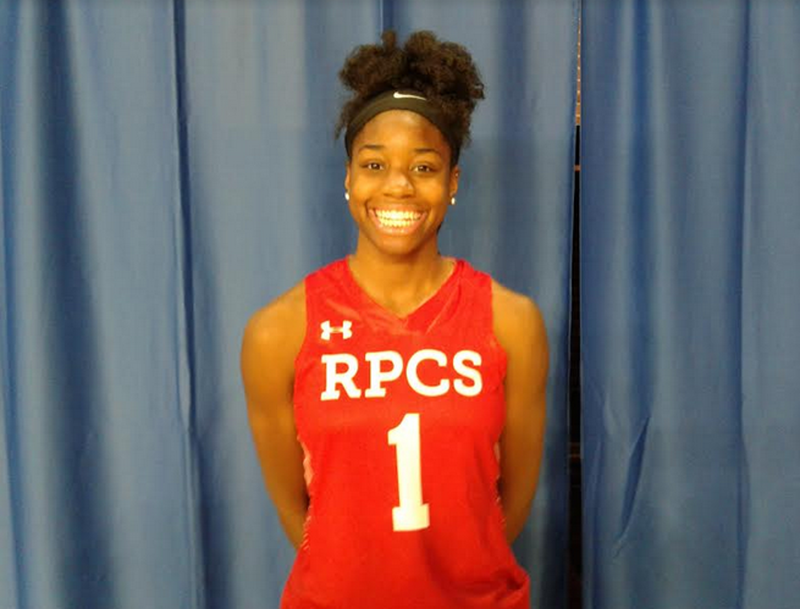 Roland Park has the more veteran lead guard play plus perhaps the best leaper currently in girls’ high school basketball in Mir McLean (see below). Over the course of the game Roland Park kept it respectable but never threatened the lead. Bishop McNamara led 16-7 after one quarter, 29-19 at half and 44-32 after three stanzas. Jakia Brown Turner (see below) led the winners with 19 points followed by Liatu King (6-0, junior, power forward) with 14 points and Madison Scott (6-2, junior, power forward) with 13 points. Mir McLean led Roland Park with 16 points followed by Ja’Niah Henson (5-3, senior, point guard) with 14 points. Westridge has one of the best guard duos (discussed in a prior article) in American high school ball. Crestwood has one of the best interior duos (one discussed in prior article, one below). Guards usually win as the above score indicates. Looking at some of the individual talent viewed in alphabetical order with height, position and school within graduation year. Location of school is in parenthesis. Many others could have been written up. Several quality players discussed recently in other articles on this site were omitted unless they were noted for receiving an award at this event. All below are Division 1 prospects at some level. Declared MVP of the Summitt (top) Division in leading her team to the title, Brown-Turner (signed with North Carolina State) gives you a strong effort each time out. A lefty, she hits the three (preferring baseline area) but is very willing to get physical to score in the key. Sometimes, you just go out there and do your best but you know achieving victory is unlikely due to overwhelming difference in firepower. Such was the case when Frederick lost to Bishop McNamara 64-39 in round one. 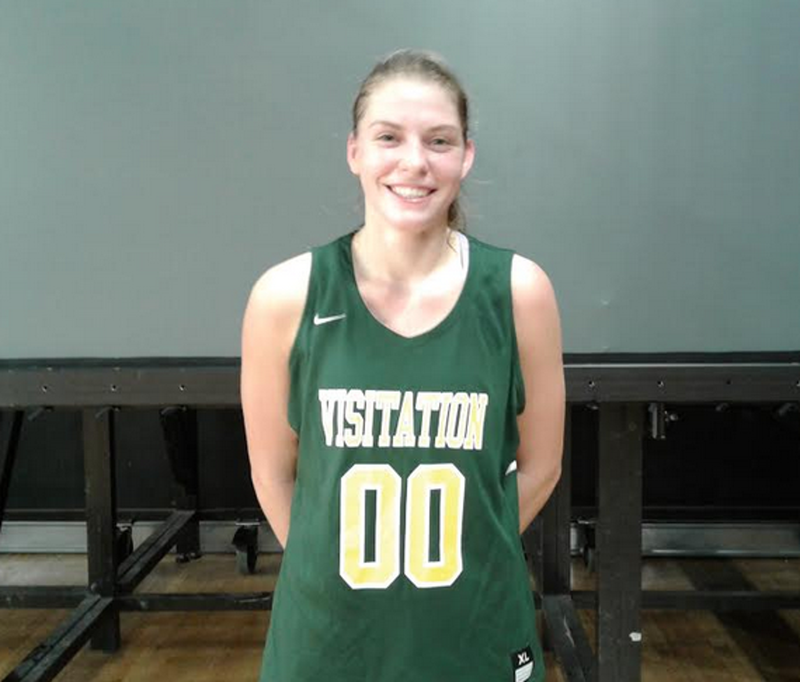 Daniels (an Arkansas signee) ran her team’s offense, attacked the basket and posted a solid 23-point outing. You got to give credit where credit is due! Signed with Princeton, Mitchell is a model of consistency with a likely double-double posted by game’s end. Her favorite move is an up-fake and drive to the rim taking any contact in stride. Her play helped her team win the Patsy Mink Division at Title IX. Unsigned but with division 1 offers, Skinner is small but very quick knowing how to get in the passing lanes on defense. Offensively, she looks to attack the basket as first scoring option. Having seen her earlier in the season, it appears her decision making has improved. Being new to the program, perhaps it has taken her time to settle in. Signed with Cal Baptist, Wu moves well and can shoot the three playing either guard slot. In her team’s 63-55 loss to National Christian Academy, she posted 18 points including four triples. Browne is solidly built and that is how she plays in the key. She is not flashy but finishes around the rim and hits the glass. 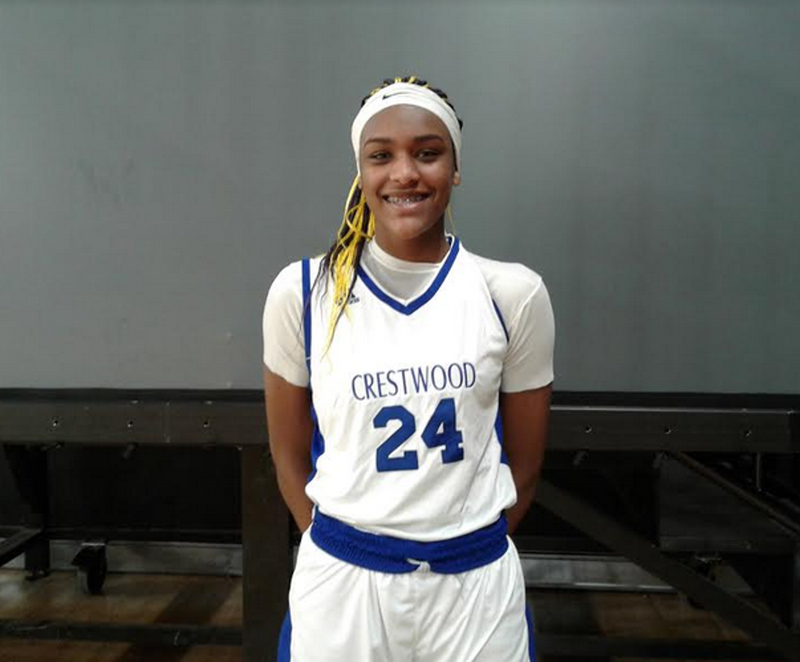 Edwards had Power 5 coaches drooling over her upside. Athletic, she has a good basketball IQ, passes well and a good set of hands. At Title IX, she posted 19 points in one outing via attacking the basket or scoring near the rim off a catch or rebound. McLean (with multiple Power 5 offers) is a high IQ player with a good motor besides being able to jump out of the gym. A double-double (points and rebounds) is a normal day at the office. At this event, she led her team to a second-place finish in the Summitt (top) Division. Bermudez has a nice stroke on the perimeter inside and behind the arc preferring the baseline area. Just as important, she appears to know when it is a good time to shoot it. In the semi-final loss to Georgetown Visitation, Clayburne posted 23 points on a combination of threes, drives and foul shots. She also handled some of the point guard duties as her team finished third in the Patsy Mink Division. Perhaps the most impressive thing about Coppola’s game is the way she thinks the game. She also uses her body well to help set up a shot in the key. At other times, it is a quick cut to reach an open spot in or out of the key that gets the job done. To use the old cliché, she just knows how to play. Williams is aptly named as she can explode to the basket off the bounce. Already having Power 5 offers, she still needs to become more consistent with her perimeter shot to complement her driving ability. Fauntleroy has good court vision and can slash to the basket. Her hands and feet are quick on defense. She needs to work on gaining consistency in hitting her outside shot.